Filters remove foreign matter that enters the tank, animal waste and any food matter left in the tank as a result of overfeeding. Using a filter correctly, and ensuring that regular maintenance is performed is essential to fish health and filter longevity. Aqua-Tech filters are sold specifically from Wal-Mart and come in several models designed to suit the needs of different aquarium sizes. Fill the aquarium with water. 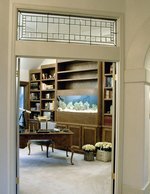 Water should come up to the bottom edge of the aquarium's top frame. If the water is not deep enough, it can damage the motor on the filter. 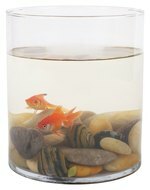 Select a filter model that is appropriate to the size of your tank. There are four sizes of Aqua-Tech filters: 5-15, 10-20, 20-40, and 30-60. The model titles reflect the number of gallons the filter is designed to maintain. Install the filtration system on the side or end of the tank making sure that the suction tube is fully submerged in the water. Plug the filter in and allow the system to run for at least 24 hours before adding fish. Unplug the filter. Remove the old filter cartridge and bio-fiber and discard them. Rinse the coal dust from the new filter cartridge. Run tap water through the filter until the water runs clear. Put the new bio-fiber into the plastic frame, and slide it into the filter body with the plastic facing the back of the filter. Pour water from the tank into the filter to reprime the motor until water starts running out the front of the filter body. Plug the filter back in and let it run. Replace the filters again in 30 days.